"Lateral Brain Anatomy", Lateral view of the brain with regions identified and AS couplet, by Illustration-Human Anatomy Chart, Couplet- Deborah Bond-Upson , Human Anatomy Chart. How Do Stories Charm the Brain? We remember stories when simple facts would be forgotten. Our brains are wired to learn from stories and to remember them. It is the special connection of stories to the brain that makes them so powerful. The great religions of the world have spread through stories in the Bible, the Koran, the Bhagavad Gita, in oral traditions in American Indian and other cultures. Ancient Hawaiians passed down history, traditions, and songs through what is still called “Talk Story.” Books and movies capture our attention, time and treasure because of their compelling stories. Generations remember details because the information is contained in stories. How could the plays of William Shakespeare continue to capture the imagination and attention of vast numbers for centuries? In addition to his literary and dramatic prowess, Shakespeare was a creative genius, creating a "story arc" to frame his works. This arc is still taught in writing and screenwriting classes around the world and is pictured below. 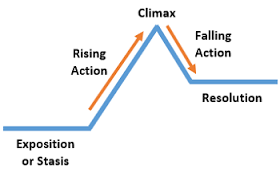 The story arc model creates rhythms and identifications that engage the brain. Joseph Campbell, the master of myth, wrote and taught of the archetypal themes and patterns in stories that interest us and that can drive our development and happiness. 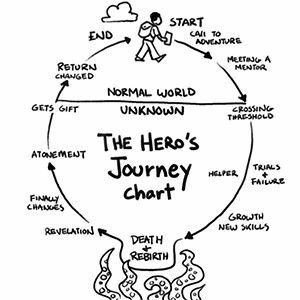 His "Hero's Journey" has been used as a creative map by many writers, George Lucas credits this concept and model with inspiring his StarWars movies. Kurt Vonnegut who has written some of the most inventive novels and short stories, tells us that most stories fit in specific categories or "shapes." Four story shapes are depicted in the graphic below. Enjoy Vonnegut hilarious lecture on the shapes of stories featuring his own drawings here. Research scientists tell us what happens when we are hooked up to an MRI machine, hear or read a story, and synapses in various areas of the brain start firing. In the brain, a story is perceived as if it is happening to us. Story information assumes a kind of autobiographical sense and thus we experience, understand, and remember on a deeper level. If a ball is thrown in a story, the part of our brain for movement lights up. For years I led GALAXY Classroom science learning program which taught through stories and hands-on science experiments. I saw that characters and story grabbed student and teacher attention and made the scientific principles more understandable and memorable. These stories can give teachers and students confidence in their ability to “do science.” The story bring the science into the brain in a natural way and fears are overcome. So when I met Carole Bos, founder of AwesomeStories, and she told me how she had built stories to launch learning across the curriculum, I 'got it.' Carole is a trial attorney who has won and mediated big national cases. One day she was reflecting on how and why she was winning and what she could do with that capability. She realized that she was using “story” in a different way than other lawyers did. When she researched a case, she would look at the evidence and ponder, "What stories will make the evidence clear and memorable and be engaging to individuals of all levels of education in the jury box and the judge's bench?" The stories she chose were stories that engaged the brain of jury members and judge, causing synapse firings, enabling them to “feel” the case in a new way. Carole then recreated this method online for education, developing model stories with primary source evidence for teachers and learners. I joined AwesomeStories to enable this powerful archive to support teacher classroom use and to develop the apps for teachers and students to research and become creators of evidence-based multimedia stories. We aligned the stories and evidence to standards and built the MakerSpace for the Humanities apps to enable teachers and students to build their own stories in this model-- whether fiction or nonfiction, articles, projects, lessons or e-books. Images, video, audios and authentic documents, and Open Education Resources (OER) are all part of creating fully-realized stories that students can use for research and for writing their own stories. Now AwesomeStories provides thousands of intriguing stories, the products of active research in world-renowned archives, orchestrating fresh story arcs for legendary, historical and popular stories, supported by primary sources to capture the reader's imagination and cause those brain synapses to fire. by Deborah Bond-Upson, the Chief Education Officer for AwesomeStories. Dr. Gregory Berns, Neuroscientist, lead author of the Emory University "Brain Connectivity" study. Dr. Renata and Geoffrey Caine of CaineLearning, authors of many books on the subject, leaders of training programs for teachers. Lisa Chipongian is a writer and editor who lives in Madison, Wisconsin, and works as an Associate Research Specialist in the Psychology Department of the University of Wisconsin — Madison. Lisa Cron, author of "Wired for Story" and other books and articles is also a producer, agent, story coach and instructor at UCLA Extention and School of the Visual Arts. Dr. Robert Epstein, is a senior research psychologist at the American Institute for Behavioral Research and Technology in California. He is the author of 15 books, and the former editor-in-chief of Psychology Today. Dr. Paul Howard-Jones, neuroscientist, author of books and articles on the impact of brain science on teaching and learning is a leader at Neuroeducation.net. NEnet is an information network hosted by the Centre for Mind and Brain in Educational and Social Contexts (M-BESC) at the Graduate School of Education, University of Bristol. Dr. Dan Jones, Associate Professor of Psychology at Washington and Lee University. Edutopia provides a very useful repository for information in this field. Visit their site here for more: Learning and the Brain. Laura Moss, writer on science and culture for Mother Nature Network. Annie Powell Murphy, education writer for the New York Times. Dr. Pamela Rutledge is Director of the Media Psychology Research Center and faculty in the media psychology program at Fielding Graduate University. Leo Wildrich, CEO Buffer, wrote an article which is featured here as "The Science of Storytelling"
Dr. Judy Willis, a board-certified neurologist in Santa Barbara, California, author, and speaker, has combined her 15 years as a practicing adult and child neurologist with her teacher education training and years of classroom experience. Dr. Janet N. Zadina, a former high school teacher and an adjunct assistant professor in neurology at Tulane University, in New Orleans, won the Society of Neuroscience's 2011 science educator award for her work training teachers in brain processes. Carl Zimmer writes books and articles, essays from the frontiers of biology, where scientists are expanding our understanding of life. He is a popular speaker and a frequent on radio programs such as Radiolab and This American Life. Bond-Upson, Deborah "Brain Science" AwesomeStories.com. Aug 26, 2016. Apr 26, 2019.